Harlem's legendary "Queen of Soul Food” Sylvia Woods, proprietor of the famous restaurant that bears her name, died on Thursday at age 86. It is with great honor and profound sorrow that The Woods Family announces the passing of their Matriarch, Sylvia Woods, known to the world as the Queen of Soul Food, who died peacefully the age of 86 today at 4:50 p.m. at her Westchester home. Ms. Woods was surrounded by a host of family and loved ones. Sylvia gallantly battle Alzheimer's for the past several years, but never once lost her loving smile. 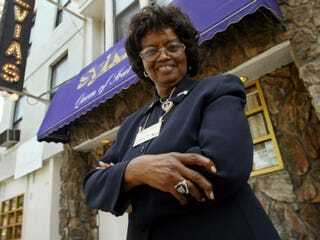 Sylvia publicly announced at her 80th birthday celebration that she was retiring and passing the torch to her children and grandchildren whom have worked side by side with her and her late husband Herbert building a Soul Food empire for the past 50 years. The Family is thankful for your prayers. In lieu of flowers please the family would appreciate donations made to the Sylvia and Herbert Woods Foundation. Woods, an ambitious and charismatic beautician from South Carolina, opened "Sylvia's" in 1962, buying the 35-seat luncheonette where she worked as a waitress. She and her late husband and childhood sweetheart, Herbert, borrowed the money from Sylvia's mother, who mortgaged the farm in South Carolina where Sylvia was born and raised to stake her daughter’s dream. "I know I had to make it or else my mama was gonna lose her farm. So I gave it all that I had to give," Woods once told Nation's Restaurant News. In 2001 the Woods family created the Sylvia and Herbert Woods Scholarship Endowment Foundation, which provides scholarships to Harlem children. Said New York City Mayor Michael Bloomberg in a statement: "We lost a legend today. For more than 50 years, New Yorkers have enjoyed Sylvia's and visitors have flocked to Harlem to get a table. In her words, the food was made with 'a whole lot of love' and generations of family and friends have come together at what became a New York institution." A statement released this evening by the Rev. Al Sharpton and his National Action Network group said: "Sylvia's has been more than a restaurant, it has been a meeting place for Black America. Rev. Al Sharpton has dined at Sylvia's for decades with everyone from President Obama to Caroline Kennedy. National Action Network has held our leadership summits there and will continue to do so in honor of the Matriarch of the Woods family, Sylvia Woods."